Standard First Aid Training, Courses and Re-Certifications. Candidates enrolled in standard first aid will learn to recognize and treat victims of severe bleeding. This page will focus on how to treat victims that are bleeding. The material posted on this page is for information purposes only, if you want to learn to recognize and treat bleeding victims through hands-on training take a standard first aid course in Edmonton, Calgary, Vancouver, Ottawa, Winnipeg, Regina or Saskatoon through a credible provider. Bleeding is defined as blood escaping from the body through arteries, veins or capillaries. People can lose significant amounts of blood comfortably over a short period of time. The average body is designed to be able to cope with a lose of half a litre of blood for 15 to 20 minutes. This is why donating blood is safe for people. However, if larger amounts of blood that the 1/2 half litre are lost or if more blood is lost in a shorter period of time the body can enter into shock. Candidates need to be award that bleeding not only occurs externally but can also occur internally. Skin becoming cool, cold pale and clammy. Victims pulse becomes weak and rapid. Victim may have difficulty breathing or shortness of breath. Victim may feel dizzy of fain. Victim may be nauseous or vomit. Capillary bleeding: This is the most common bleeding which occurs from capillaries. In this injury blood slowly leaves the body in a steady viscous path. Venous bleeding: This is bleeding that results in blood leaving in a steady flow. The blood may seem darker than arterial blood. Scenarios in which the victim has cut a larger blood vessel may involve significant blood flow. Arterial bleeding: This is bleeding that results in blood from an artery spurting or pulsing out. The colour of the blood is typically bright in colour. bleeding wound candidates must make sure that the airway, breathing and circulation are assessed and EMS has been notified (through a bystander preferably). Prior to applying any dressing to a bleeding wound candidates should ensure that the victim is at rest. Putting the victim in a supported and resting position can help reduce blood loss by slowing circulation to a resting heart rate. Candidates must place firm and direct pressure onto the wound. 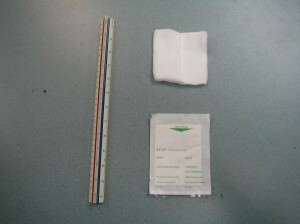 Candidates that have available first aid kits can use gauze and triangle bandages to create direct pressure through a loop tie. 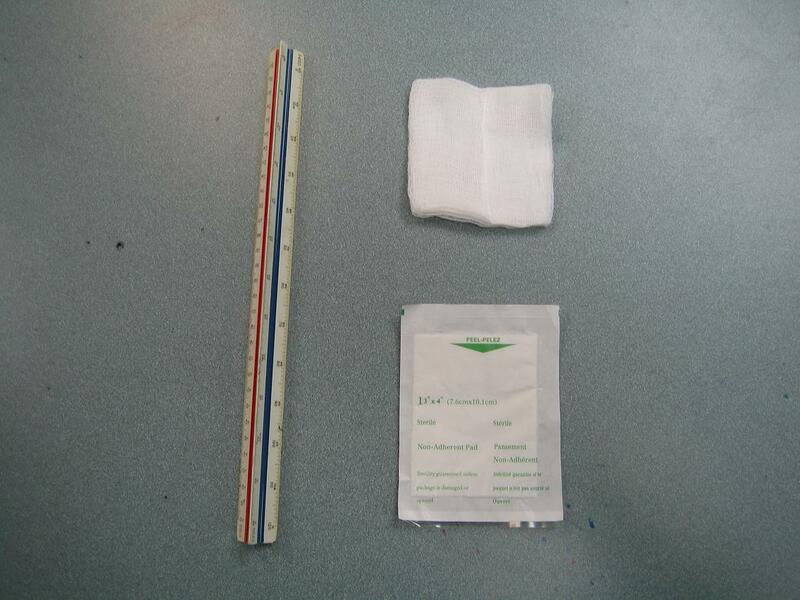 Rescuers can also use tensor bandages. Rescuers should be careful not to place the dressing or tie too tightly around the victim as to limit blood flow to the remainder of the extremity. Rescuers can check for distal circulation below the wound to assess blood flow and to check if the dressing has been tied too tightly. If the bleeding soaks through the gauze, dressing and / or the bandage, candidates should place more dressing or gauze over the wound. Do not remove the dressing as any clotting that has taken place will be adversely affected. The limb should be secure and supported while the dressing is being applied. Rescures should attempt to only use clean and sterile dressing on the wound. For additional pressure candidates can place a gloved hand over the wound. For more information and to learn how to do hands-on treatment of bleeding wounds throughout the body enrol in a standard first aid course near you. Registration is quick and easy and can be completed on-line. Register with one of our training partners today.